Everybody knows the markets are more volatile now than they were just a few weeks ago. But exactly how volatile are they know, and how calm were they previously? Can we use numbers to describe those things? It turns out we can. In finance there’s a metric called the Sortino Ratio. It measures return relative to downside volatility (a variation of standard deviation). A higher number is better than a lower number, but the number can get higher in a few different ways – returns can go up, downside volatility can go down, or both returns can go up and volatility can go down simultaneously. Higher returns by themselves are not enough to make the metric move, if they come with more downside volatility. Over the 10- and 15-year periods ending January 31, 2018, the Sortino Ratio for the S&P 500 Index was 0.99% and 1.08%, respectively, according to Morningstar. But over the past 3- and 5-year periods, the Sortino Ratio for the index has been 2.67% and 3.10%, respectively. Clearly we’ve been spoiled with 3- and 5-year periods of high returns with little downside volatility – around triple the ratio of the longer term periods. Over long periods of time, the market doesn’t deliver such robust high volatility-adjusted returns. Ironically, the fraudulent Sortino Ratio of Bernie Madoff’s hedge fund was 2.95%. 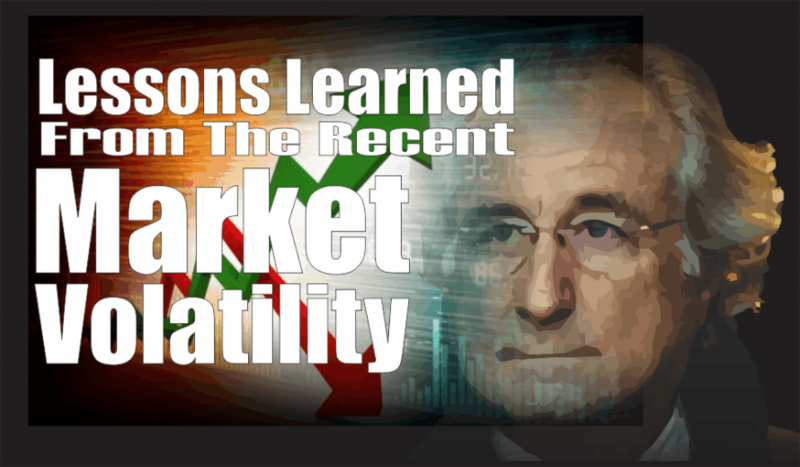 Madoff didn’t advertise market-beating returns, but returns that were close enough to the market’s with hardly any volatility. Somehow – probably with the help of very low interest rates and investor psychology – we’ve gotten a Sortino Ratio over the last 3 and 5 years that roughly matches that of the Madoff fraud. The first obvious lesson for investors during this bout of volatility is that periods of uninterrupted returns don’t last. A correction is a normal part of investing. It’s not that investors get paid for enduring volatility, as some theories suggest; it’s that volatility is simply the price of admission into the stock market. Returns or getting paid comes from being careful about how much you pay for stocks. Another lesson is that investors should have an appetite to start buying when prices drop. If you don’t feel like buying, but, instead, want to sell, it’s very likely your allocation wasn’t correct to begin with. Nobody likes to see any part of their portfolio decline, but if the decline has hit a piece of your assets that doesn’t make you want to throw in the towel, that’s a good sign. Stocks may still be to expensive, but a good investor should at least be thinking about buying during and after big declines. In fact, if you’re still employed and making automatic contributions to 401(k)s and other accounts, take some satisfaction in knowing that you’re contributing new money to your retirement accounts, and buying stocks at lower prices. Third, take this bout of volatility as an invitation to rebalance your portfolio and reassess how much stock exposure is really appropriate for you. Many people fill out asset allocation questionnaires when they set up financial plan, and those are generally good things to do. However, it’s difficult for people to answer questions about how much risk they can assume honestly when we haven’t had volatility for a long time. Our brains are short-term oriented, and we are influenced by things that have happened recently. So it’s hard for investors to remember how they felt in 2008 and 2009. Last, get updates from your advisor about the market’s Sortino Ratio. It’s been around 1 for a long time. If it starts flashing anything over 2, and gets near 3, you know things have been too calm and returns have come too easily.